I love the new Reaper Chronoscope line. For those who do not know, Reaper (well known for their fantasy miniatures, have created a non-fantasy, multi-genre miniatures line. Street thugs, cowboys, sci-fi troopers, even Sasquatch is hiding in there. I picked up just about every Chronoscope miniature they had at Gencon. 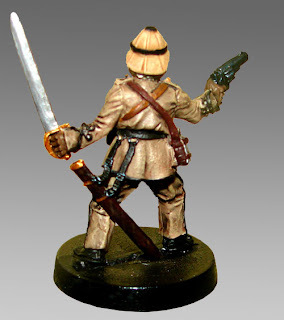 A friend of mine wants to create a Lost World themed miniature skirmish group and the British Officer from the Chronoscope line was a good fit. When I get a new model I search for web for painted pictures to see how others have taken on the project (ahh, coolminiornot). Being so new I was unable to find a painted picture of this model but I was not without inspiration. The good Colonel has a striking resemblance to Van Pelt from the Jumanji. 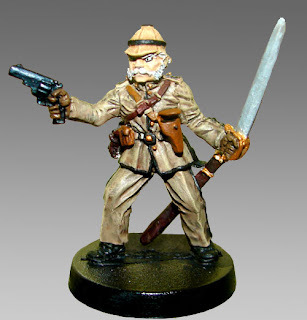 I wanted to darken this version up a little, but basically the same Khaki uniform theme complete with pith helmet. While the figure is riddled with all kinds of details (canteen, pistol and holster, sword and sheath) the level of accuracy went downhill once I starting putting paint to metal. There were gaps and blurred seam lines between the extras and more flash that I would expect for such an early cast but all in all, it is a nice model and, like all Reaper models, it’s a total bargain. Here he is, painted in Reaper paints with Reaper paint brushes. Any hidden brand loyalty? This mini is so cool I put a link to it on my blog. Nice work!